Obviously, we need a server and a SSH connection to it. In this example I am using a Debian Wheezy server as host. Of course, you can use whatever OS and install image you like. This command creates a VM named “debian” of type Debian 64bit and registers it (for other OS see “Tips” at the end of the article). 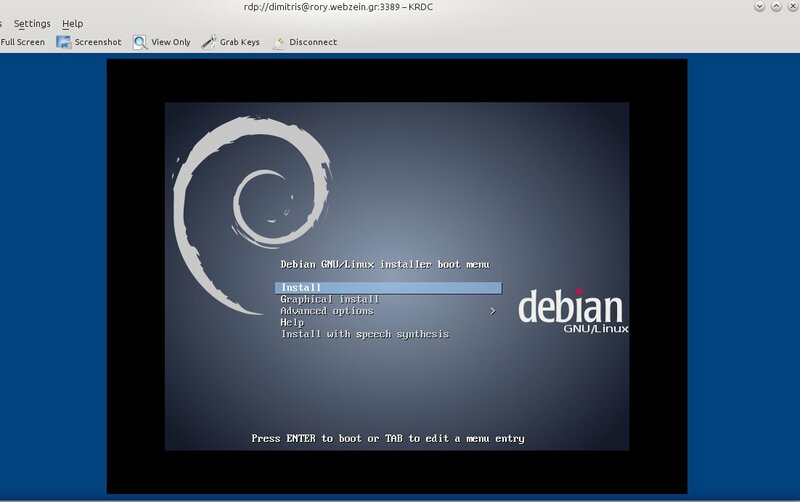 Here, we specify that our “debian” VM should use 512MB of RAM from its host, have a virtual DVD as first boot device and a NIC card in NAT mode which is the default networking mode for VMs running in VirtualBox and it suits our purposes (at the moment). With the above command I created a virtual hard disk called “debian.vdi” of 40GB total size. VBoxManage storageattach "debian" --storagectl "IDE Controller" --port 0 --device 0 --type hdd --medium "debian.vdi"
The command above attaches the virtual disk called “debian.vdi” to port 0, device 0 of the virtual IDE controller as hard disk type (hdd). [email protected]:~# VBoxHeadless --startvm "debian"
You’ll see the familiar debian grub screen to begin the installation process. VBoxManage modifyvm "debian" --natpf1 "natapache,tcp,,9000,,80"
By default, the current state of the VM is cloned without any snapshots. If you want to clone the snapshots as well, use the “–mode all” parameter. VirtualBox will recreate the VM completely for you. I’ve followed the tutorial till the end, but when i try to connect to VRDP i get error: “no bootable medium found”, please help. Obviously, something went wrong when you installed your preferred OS. This message has nothing to do with VirtualBox. You should attach the OS installation ISO to your VM and try to re-install the operating system. Thanks for the tutorial but, before trying it, I’d like to know if it is still considered up to date in april 2017.